The protein data bank currently contains more than 10.000 experimentally determined enzyme structures. Enzymes are fundamental to life because they function as Nature’s own catalysts, speeding up many chemical reactions in cells by stabilizing the transition state of substrates. The vast majority of enzymes are proteins, although specialized RNA molecules with a catalytic function (ribozymes) have also been described. Enzymes catalyze almost all metabolic reactions usually in a sequential fashion (pathway). It is therefore not surprising that various human diseases are linked to an enzyme deficiency or malfunctioning enzyme like Gaucher and Pompe disease. Enzymes are commonly classified based on the type of chemical reaction they catalyze. Figure 1 shows their subdivision into hydrolases, transferases, oxidoreductases, lyases, isomerases and ligases. The number of structures available in the protein data bank is listed next to the enzyme class. Enzymes are able to catalyze over 5000 different biochemical reactions. In order to display biological activity, many enzymes require organic or inorganic molecules, which are known as cofactors. Organic cofactors include riboflavin and heme, while metal ions serve as inorganic cofactors. Organic cofactors are either covalently attached to the protein backbone (prosthetic group) or released during the catalytic cycle (coenzyme). The enzymes shown in figure 2 illustrate the use of an organic molecule either as cofactor or coenzyme in redox catalysis. AldO is a flavin-dependent carbohydrate oxidase originally identified in Streptomyces coelicolor and catalyzes the selective oxidation of the terminal hydroxyl group of its carbohydrate substrates. The structure of this enzyme was solved in 2008 at a resolution of 1.6 Å (1), showing that the overall structure comprises an FAD-binding and substrate-binding domain. The structure contains: (i) covalently bound FAD (purple), which is located deep in the protein and (ii) xylitol, its preferred substrate (blue). FAD is used to shuttle electrons from the substrate upon oxidation to molecular oxygen, serving as electron acceptor and is thereby reduced to hydrogen peroxide. Baeyer-Villiger monooxygenases, (BVMOs) also employ FAD as cofactor as well as NADPH as coenzyme. These enzymes catalyze the insertion of a single oxygen atom next to a carbonyl group, which requires breaking of a C-C bond and results in formation of an ester or lactone. 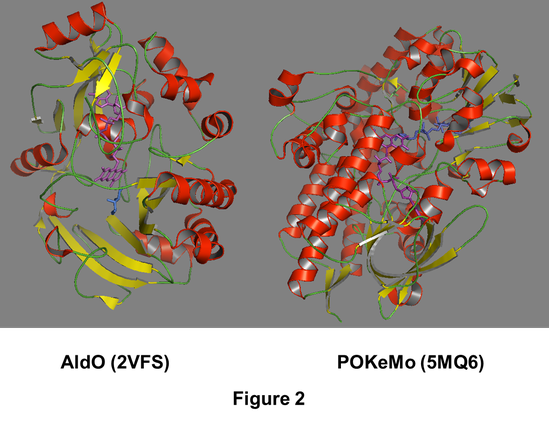 Polycyclic ketone monooxygenase (POkeMo) is a novel BVMO from the fungus Thermothelomyces thermophile. POkeMo is active with bulky and complex substrates such as cyclopentadecanone as well as steroids including stanolone (2). The structure of this enzyme (5MQ6) was solved recently at a resolution of 2.0 Å, revealing an overall structure similar to other BVMOs. This comprises an FAD domain, an NADP domain as well as a helical domain. Moreover, the structure contains FAD (in purple) and NADP+ (in blue). NADPH is used to reduce FAD, which enables formation of the peroxyflavin intermediate upon binding of dioxygen. This intermediate represents the business end of BVMOs because it facilitates insertion of an oxygen atom adjacent to a carbonyl group, while the other oxygen atom is reduced to water. Heme is another cofactor often employed in redox reactions and is found in a variety of enzymes, such as catalases, cytochrome P450 monooxygenases and peroxidases. 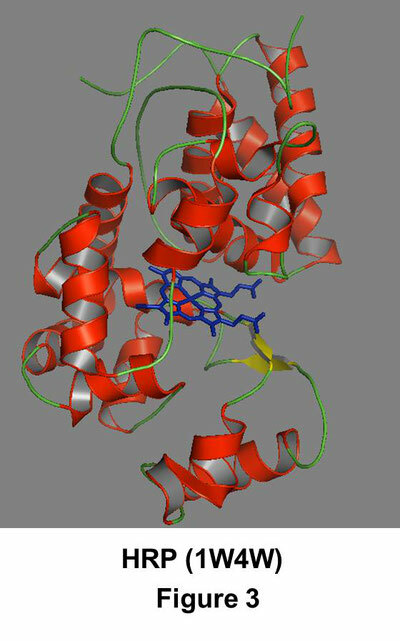 Horseradish peroxidase (HRP) represents a prototypical peroxidase and has been studied for more than a century. Consequently, a wealth of biochemical and structural data is available. Several high resolution structures of HRP have been solved with a variety of ligands. The structure depicted in figure 3 was solved in 2005 at a resolution of 1.55Å (3) and reveals that the overall structure of the enzyme comprises a distal and a proximal domain with the heme cofactor (in blue) sandwiched in between. HRP catalyzes the oxidation of substrates using hydrogen peroxide. This is typically a two-electron oxidation, which proceeds via two one-electron reduction steps. In the first step of the catalytic mechanism, hydrogen peroxide reacts with the resting enzyme, resulting in compound I. This intermediate is a porphyrin-based cation radical which possesses enough oxidizing power to perform oxidation of one substrate molecule. This first one-electron reduction step generates a radical product and compound II. This intermediate is also a powerful oxidizer like compound I and is able to oxidize a second substrate molecule. Following this second one-electron reduction step, the enzyme returns to the resting state. CoA ligases (synthetases) represent an important class of metabolic enzymes that belong to the family of adenylating enzymes, which also includes luciferases as well as adenylation domains of non-ribosomal peptide synthetases. 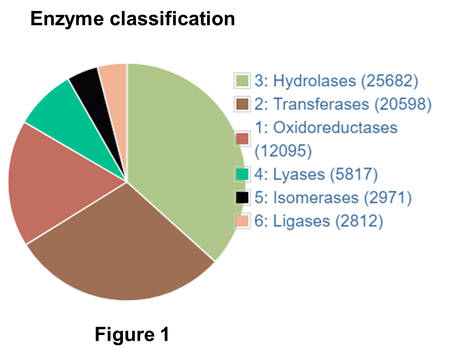 CoA ligases play a key role in a variety of biochemical reactions such as the breakdown of fatty acids and halogenated aromatics. These enzymes typically catalyze the first step of a degradation pathway by activating a carboxylic compound through derivatization with coenzyme A (CoA). This reaction comprises two steps. First, a carboxylic substrate reacts with ATP in an adenylate-forming reaction, yielding an acyl adenylate. Subsequently, the adenylate intermediate is converted into a CoA adduct in a thioester-forming reaction, thereby releasing AMP (figure 4). 4-Chlorobenzoate:CoA Ligase (CBAL) is the first enzyme in the degradation pathway of 4-chlorobenzoate and several structures of this enzyme have been presented in combination with different ligands. Interestingly, two structures were solved that contain the adenylate intermediate or 4-chlorophenacyl-CoA (an inert analogue of the CoA derivatized product) and AMP (4). These structures, correspond, therefore to one of the two half reactions, namely the adenylate intermediate-containing structure (3CW8) represents the adenylate-forming state, while the structure with the CoA derivatized analogue (3CW9) corresponds to the thioester-forming reaction (figure 4). The structure of CBAL with the adenylate intermediate was resolved at a resolution of 2.25 Å, whereas the structure bound the CoA derivatized analogue and AMP was determined at a resolution of 2.0 Å. 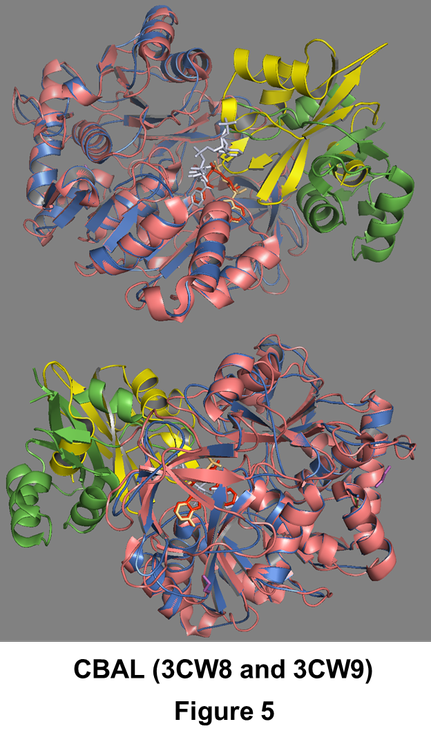 Both structures show that the enzyme is of overall globular shape and comprises a large N-terminal domain (pink in 3CW8 and blue in 3CW9) connected to a small C-terminal domain (green in 3CW8 and yellow in 3CW9). The adenylate intermediate of 3CW8 is shown in yellow, while AMP in 3CW9 is in purple and the CoA analogue is in red. Both structures show that the active site is located at the interface between the domains buried in the protein and comprises a substrate binding pocket (at the N-terminal domain ) and ATP binding site. Moreover, the thioester-forming structure shows that the nucleotide of CoA is located at surface of the enzyme, while the pantetheine portion of CoA enters the ATP binding site through a tunnel that runs between the two domains. This tunnel is called pantetheine tunnel and is not observed in the adenylate-forming structure. This tunnel can only be created following rotation of the C-terminal domain. With regards to this it is interesting to note that the C-terminal domain of the enzyme in the thioester-forming state adopts a completely different conformation when compared to the adenylate-forming structure. 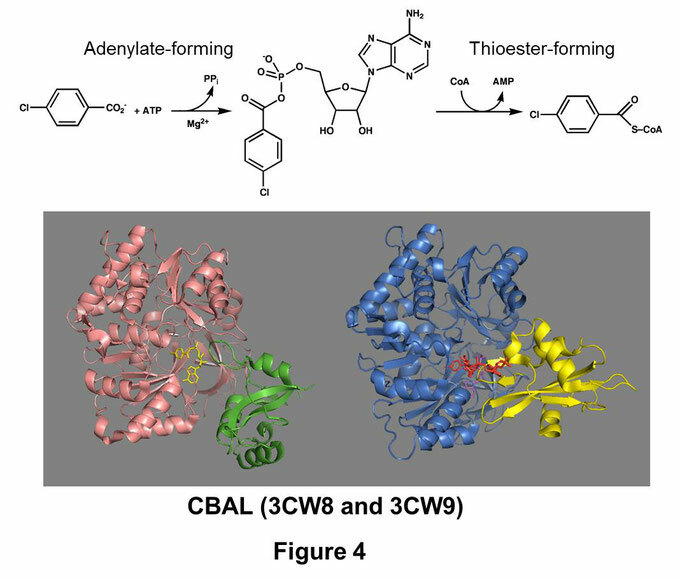 Figure 5 shows a structural alignment of CBAL in the adenylate and thioester-forming state. This shows a complete overlay of the N-terminal domains (colored pink in 3CW8 and blue in 3CW9), while the C-terminal domains (green in 3CW8 and yellow in 3CW9) adopts a vastly different conformation. Specifically, the C-terminal domain in 3CW9 has rotated about 1400 and this domain rotation creates the pantetheine tunnel, allowing CoA to enter the active site and to form a substrate thioester. This domain alternation is different from the small conformational changes employed by many enzymes as part of their catalytic mechanism. Large domain movements in multi-domain enzymes are often used to transport substrate molecules. However, members of the family of adenylating enzymes utilize domain alterations to reconfigure the same active site for two different half reactions (5). The high resolution structure of lysozyme allowed for the first time assessment of a catalytic mechanism, which was however recently revised (6). This key finding paved the way for the current detailed understanding about how enzymes perform their magic. It has been reported that enzymes are able to catalyze over 5000 different biochemical reactions, thereby performing vital cellular functions. It is therefore not surprising that many human diseases have been linked to an enzyme deficiency or malfunction. The detailed structural information of enzymes advanced the insight as underlying cause of human diseases and allowed the design of novel drugs as well as drug interaction studies. Moreover, enzyme-catalyzed reactions often display outstanding selectivity and good yield, which are difficult to achieve by chemical means. Enzymes typically operate under mild reaction conditions and often use cheap cosubstrates (e.g. oxygen). These features ensure that enzymes are also biotechnologically relevant as substitute for traditional chemical catalysts or as a basis for a novel biocatalytic process. The high resolution structures of enzymes have not only unearthed their elegant catalytic mechanisms but also serve as a basis for rational protein engineering to redesign their properties or introduce novel activities (7). 1. Forneris, F. et al. (2008). Structural Analysis of the Catalytic Mechanism and Stereoselectivity in Streptomyces Coelicolor Alditol Oxidase. Biochemistry 47: 978-985. 2. Furst, M.J. et al (2017). Polycyclic Ketone Monooxygenase from the Thermophilic Fungus Thermothelomyces thermophila: A Structurally Distinct Biocatalyst for Bulky Substrates. J. Am. Chem. Soc. 139: 627-630. 3. Carlsson, G.H. et al (2005). Complexes of Horseradish Peroxidase with Formate, Acetate, and Carbon Monoxide. Biochemistry 44: 635-642. 4. Reger, A.S. et al (2008). Structural characterization of a 140 degrees domain movement in the two-step reaction catalyzed by 4-chlorobenzoate:CoA ligase. Biochemistry 47: 8016-8025. 5. Gulick, A.M. 2009. Conformational dynamics in the Acyl-CoA synthetases, adenylation domains of non-ribosomal peptide synthetases, and firefly luciferase. Biochemistry 10: 811-827. 6. Vocadlo, D.J. et al (2001). Catalysis by hen egg-white lysozyme proceeds via a covalent intermediate. Nature 412: 835-838. 7. Packer, M.S. and Liu, D.R. (2015). Methods for the directed evolution of proteins. Nat Rev Genet. 16: 379-394.